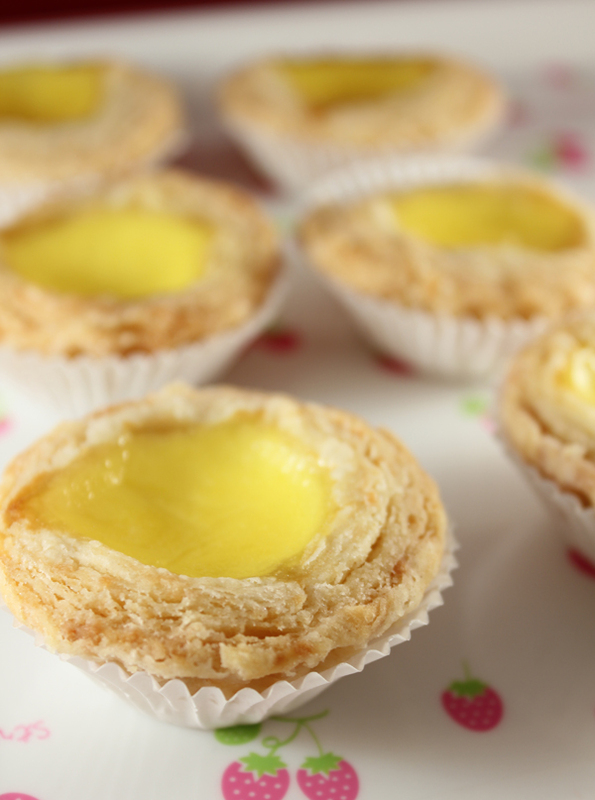 My search for the perfect egg custard tart, or dan tat, has come to an end. I've been testing recipes for over a year. I've been playing with different recipes, and tweaking ones I thought were good. I have now come to a conclusion. This recipe for egg tarts is exactly like the ones at a good dim sum place. It's flaky like puff pastry but still buttery and crumbly like shortcrust pastries. 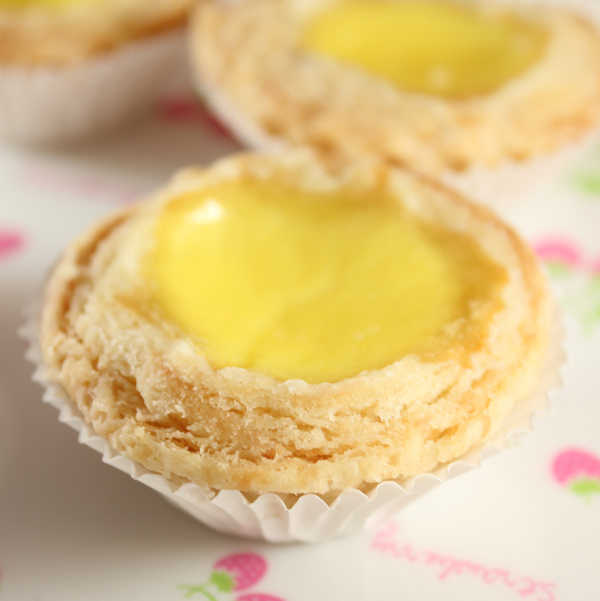 It's what a good egg tart should be. I tried 3 different recipes in the same day. 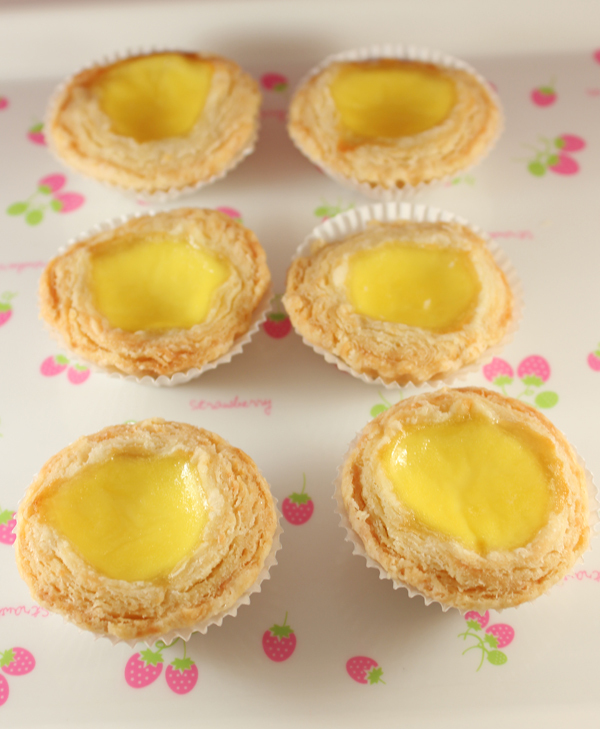 Not caring about the way they looked by the third recipe, I stuffed them into the egg tart tin/mold and baked away. Unknowingly, that last recipe was everything I ever wanted in a recipe. So these egg tarts aren't as pretty as they can be, but they taste so delicious. I will have to make these again, paying extra attention to making them pretty next time for you. You can see all those layers that make it so flaky and crumbly. They hold their shape when you bite into them. It's perfect. 1. Make oil dough first. Put flour in a large mixing bowl. Add in butter, and cut using a pastry cutter. Then add shortening. Use a pastry cutter to combine into a dough. 2. Place in plastic wrap and freeze until firm. Mine takes about an hour. 3. For water dough: Put flour in a large bowl. Add in egg, sugar, and shortening. Mix. Add in cold water. Mix until a dough forms. Do not over mix. 4. Place in plastic wrap and freeze until firm. 5. After doughs are firm. Preheat oven to 350F. Make egg filling. 6. For egg filling: Boil water with sugar, until sugar dissolves. Let cool. 7. Mix eggs with half & half using a fork. Try not to add bubbles. 8. After sugar cools, add to egg mixture. Sieve mixture twice. Cover and keep in fridge until ready. 9. Roll out the oil dough into a rectangle. 10. Roll out the water dough into a rectangle that is twice as long as the oil. 11. Put the oil dough in the center of the water dough. Fold up both ends of the water dough to meet in the center, covering the oil dough completely. 12. Roll out flat. Fold into quarters. Freeze 20 minutes. Repeat twice. 13. Roll out flat and thin, then cut dough using a round cookie cutter a little bigger than the tart tin's diameter. 14. Place each circle into the tart tin (mines were 2 inches in diameter on top), and press into mold. Repeat with all of dough and mold. 15. Place molds on a baking sheet. Pour egg mixture into prepared mold until 4/5 full. 16. Bake for 25 minutes or until golden. Do not let the centers bubble up or form spheres. Your oven is too hot if it does. You will love these, I promise. As a person who grew up eating many dan tats, these look delicious!! Thanks for sharing your recipe. I'm putting this on my to-do list! That surely looks mouthwatering! I've never made egg tarts before but it looks easy enough. Gonna try this soon! Wow, it looks sooooo very good! I'm looking for a long time for a good (puff pastery) egg tart recipe and tried a lot of recipe but there were not so flaky. 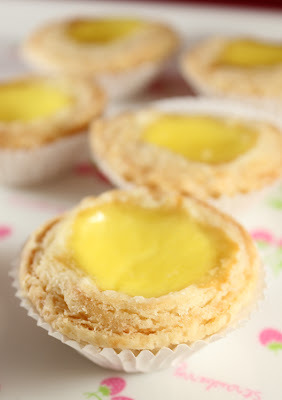 But when I saw your egg tart, it looks like the orginals in HK and I love it! 1. Did you put the oil and waterdough in the freezer or refrigerator? 2. When you cut the dough with a round cookie cutter, do you put the dough right in the tarttin or do you put it for a while in the freezer? 3. Did you spray some baking spray or butter inside the tarttin? 4. I see many recipes, if they put the dough in the tarttin, they put 3 holes with the fork. Did you do that also in this recipe? Hopefully you can give answer on my questions so I can make your lovely egg tart! Hi Tang! Here are my answers! 1. I put it in the freezer to help speed it up, because I was trying out several recipes that day. But you can put it in the fridge, but it will take longer to firm up. 2. I put it right into the tarttin, and then onto a baking sheet. After all the tarttins are filled, I bake them. No freezer or fridge. 3. I did not spray or butter the tarttins. There's enough oils in the dough to prevent sticking. 4. I did not poke holes in my dough after putting them in the tarttin. The center of the dough does not balloon up like other tarts. sorry for my stupidity, but what is the half & half you mentioned in the egg filling recipe? @Darren Tu Tu Hi Darren! Half and half is available in the dairy section of the store. It's usually poured into coffee. However, you can make your own half and half by combining half milk and half heavy cream together. Hope this helps! I have questions about the oil dough. How about how long will it freeze? I waited for 2 hours and it was still gooey. I converted the recipe into the tablespoons: 10 tbsp of butter and 19 tbsp of shortening. Is this too much? I thought I ruined the oil dough so I threw it out...what a waste. so what should I do? :( I got to make dan tat for my aunt's birthday. Thank you. @Winnie Wong Hi Winnie! I froze my dough for about an hour. But you can always leave it in the refrigerator overnight. I have never made this recipe using tablespoons. I recommend you get a food scale to get more accurate measurements. However, 10 Tbsp sounds about right for the butter and probably 18 Tbsp for the shortening. But again, a scale wil be the best for this. Ur 蛋撻 looks awesome! Thanks for sharing the recipe. Thinking about trying these tomorrow morning..may I ask how many tarts ur recipe makes? One quick question, can we replace the shortening with butter because I prefer working with that. And if not, can we just skip the dough part and use your own pie crust with the filling? Thanks so much for sharing your recipe! I did try it the other day but also had the same problem as Winnie. I followed your recipe exactly using a food scale but also struggled with the oil dough. It was very gooey even after being in the freezer that it was hard to get a handle on the dough. It was also a lot bigger than the water dough, and broke through the water dough when we were trying to make the folds. We ended up mashing the doughs together however we could and baking it anyway -- the crust ended up being a crunchy, bubbly mess in terms of texture/consistency, but the taste was definitely spot on -- so know that it's about getting control of the crust. Wondering if you've ever had a similar problem with the recipe and if you have any tips? Thanks! @Cat Hi Cat. I did run into this problem before. For the oil dough, I found that cutting in the butter only first, then mix/cut in the shortening second helped. Do freeze until the oil dough is firm. Depending on how cold your freezer is, time will vary. My takes about an hour. Doing these steps have prevented the mess. I had perfect dough after that. Hope this helps. Hi Gwen, I tried your recipe three times and it failed every single time. The tarts turned into an oily mess every single time :( Is there maybe something wrong with the measurements for the oil dough? I used a food scale to measure all the ingredients exactly as written in the recipe. I also froze the oil dough for 4 hours and it was still soft. Do I need to freeze it till it is totaly frozen for it to set enough? I roll/smash my oil dough flat between plastic wrap before putting it in the freezer. When I take my oil dough out. It is hard and set. The measurements are correct in the recipe. However, you can remove 50g of shortening in the oil dough, this will make it easier and still won't affect the taste. I also made a flat rectangle of the oil dough before I froze it, but it just wouldn't set :( I'll try using less shortening tomorrow :) Thanks for the tip! Still didn't work. The oil dough was frozen solid (still easily pliable, but frozen). The rolling went ok, but the water dough teared because it got too thin. The crust turned out like it had all these little holes in it and my baking tray was covered in melted shortening afterwards *sigh*. How do I process twice as much oil dough into the water dough without the water dough tearing up? I've been running into the exact same problems as Ribbity too. I also tried it multiple times, but either the oil dough would melt too quickly even after it was well frozen, or the water dough would tear easily and the oil dough would quickly overwhelm the thin layer of water dough and become a mess. I tried sprinkling more flour throughout while rolling the dough to keep it a little drier and more manageable to work with, but I think i ended up doubling the amount of flour by the end and the tart wound up tasting really chalky! Guess we need to have really good dough working skills to pull it off. I feel your pain, Ribbity! - I added more water to the water dough. This made the dough more elastic, so less prone to tearing when rolling. I didn't measure precisely, but I kept adding water till the dough looked smooth. - I used 100 grams of shortening instead of 250, this made the oil dough an actual dough, instead of the buttercream consistency the original recipe had. The result is a bit more dense than on the picture, but at the the crust did have layers :) and a flaky texture. I'm gonna try adding more shortening to the oil dough next time. can i know what you mean on 'fold into quarter' on step no:12? Hi, am I just missing it somehow? But what temperature should I be baking the tarts at? Love your blog. What is shortening? And where can find it in the shops? Does this recipe make about six dan tats? Hello what temperature do you bake the tarts? The tarts are baked at 350F for 25 minutes. I had lots of problems with the dough as well. Oil dough was sticky and lumpy, water dough was dry and there was tons of flour left over that didn't mix in, and full of holes when I rolled it out. Ended up asking my husband to go pick me up a box of tart shells. :( The tarts are in the oven now. I might try this again if they taste right but I think I generally need more pastry practice. Your pictures look like the flakiest crust I have ever seen. I am going to try this tomorrow or today. Do you use salted or unsalted butter? @Sara Lee I used unsalted butter. I got about 24 medium sized egg tarts from the recipe. It will vary slightly depending on what tart pan you use! Hope this helps. I only recently found this recipe and gave it a try. Overall it was mostly a success. I followed the recipe as it is written. However, I did wish I read the comment about cutting the butter first before adding the shortening in the oil dough. This is how I got the dough to work. Water dough, yes it starts out kind of dry. I combined everything with a fork until it started to coming together a little bit. I kneaded the dough in the bowl and picked up all the remaining bits. I continued to knead the water dough on the countertop until smooth. This will require some elbow grease, time and patience. It will get there. It just takes time. I saw comments from those who struggled with the crumbliness of the water dough, the messiness of the oil dough, the weird proportion of the huge amounts of oil dough vs the small amount of water dough needed to wrap around the oil dough....for me those were all true. With lots of kneading, the water dough was able to be usable but with such small quantities paired with the huge mess the oil dough was even after freezing it for 3 hours, it did not work out. 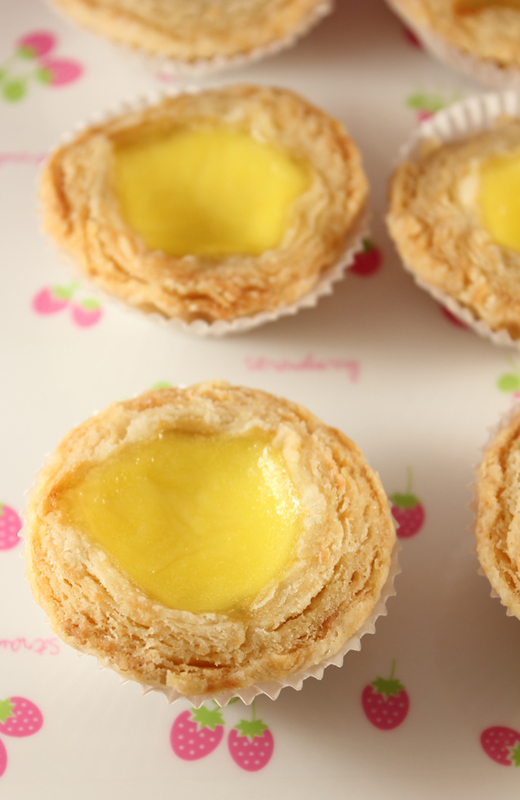 I ended up making some test tarts which ended up like bland custard in biscuit like pastry shells. No good for me, and I followed all of the advice in the comments. Moving on to a different recipe to try out next time, I guess. Hi,Gwen,I would like to ask what is the meaning of 80 ml half and half? Hi Gwen, thank you for the recipe. I would not call the other "one dough" "easy dan tat" recipes out there dan tats. Such a disservice to the wonderful flaky crust that makes what dan tats are - deliciousness! I actually get so perturb at those people publishing crap like that and people that praise it. Seriously it is not hard to make it the real way. I followed the recipe exactly and measured everything out, but the dough came out messy and gooey. After baking them I was so embarrassed to share it with the family I tossed the lot out. The picture looks nice and I'm sure you were able to make it come out alright, but maybe the recipe needs some revision for others to follow it. how many tarts for this recipes?